The teachers’ strike in Los Angeles started last week and stretched for six long days, encompassing some of the rainiest days that we have experienced in the region. 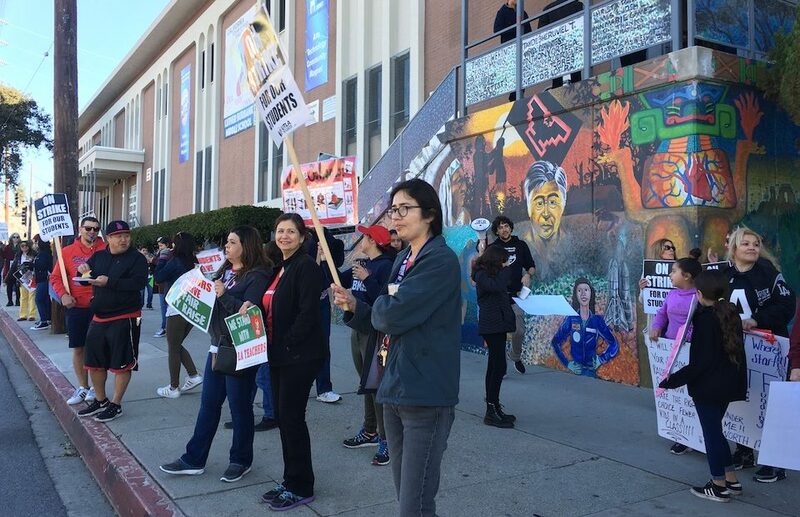 Still, 30,000 LAUSD teachers and employees—as well as students and supportive parents—stood beneath red umbrellas and raincoats, holding signs and expressing the need for better funding. The strike ended this morning. But today, many teachers are asking if losing 3% of their salary by not working for six days was worth the outcome. The district has agreed to reduce class sizes and hire more support staff, but the change will occur during the next few years. Perhaps, in the end, the biggest win is that there is more local and national awareness about California’s poor choices in education funding and a better understanding that the state has to step in to bring about change. Ever since 1978, when Ordinance 13 placed a cap on residential taxes toward education, California’s public education has fallen behind. Today, once living costs are taken into consideration, California ranks #46 in the national ranking per student spending. The article, “Does California Skimp on Education?” on Ed100 provides an excellent overview about the failures of the current system. “Since 1970 California has increased spending on prisons and incarceration about three times as much as it has increased spending on education,” the article states. Yesterday, I took Minal and some of her friends to witness the teacher picket lines at a middle school, where one of our friends teaches. The sky had cleared and temperatures dipped low. As we held up our signs, cars drove by, honking support. I was reminded of the teacher hunger strikes in Karachi more than four decades ago in which my mother participated. When we drove away, I realized—all over again—that in order to push for change, we have to claim the fight no matter where we live and we have to start young.